Residents living in Anchorage, Alaska, were sent running for the hills early Friday after a 7.0 magnitude earthquake - and several aftershocks - rattled the region. It's unclear whether there are any injuries or deaths related to the incidents at this time. According to the US Geological Survey, the powerful quake was recorded at 8:29 a.m. local time, striking nearly nine miles north of Anchorage. Since then, several aftershocks have been reported across the area, with the strongest registering at a magnitude of 5.7 on the Richter scale. ​​Officials have cancelled the tsunami warning that was issued for parts of southern Alaska, now turning their attention to assessing the damages. Alaska's Republican Gov. Bill Walker issued a disaster declaration in the aftermath, writing on Twitter, "Major General Laurie Hummel & I are now working w[ith] emergency responders to make sure Alaskans are safe." No tsunami warnings have been issued for the US west coast or Canada's British Columbia, according to the US National Tsunami Warning Center. ​Michael Burgy, a senior technician with the National Tsunami Warning Center in Palmer, Alaska, told CNBC in a statement that the tsunami warning for southern Alaska was automatically triggered due to the size of the quake and the proximity of its epicenter to nearby shorelines. He explained that officials ultimately decided to cancel the warning after they detected no changes in gauges used to monitor the size of waves. Photos shared on social media show cars stranded on cracked highways, collapsed ceilings, homes with littered floors and even children hiding underneath chairs and tables in an effort to protect themselves from falling debris. ​"The main thought that was going through my head as I was trying to get out the door was, 'I want this to stop,'" David Harper, who was purchasing some coffee when the quake struck, told AP. "[The quake was] significant enough that the people who were outside were actively hugging each other." "You could tell that it was a bad one." 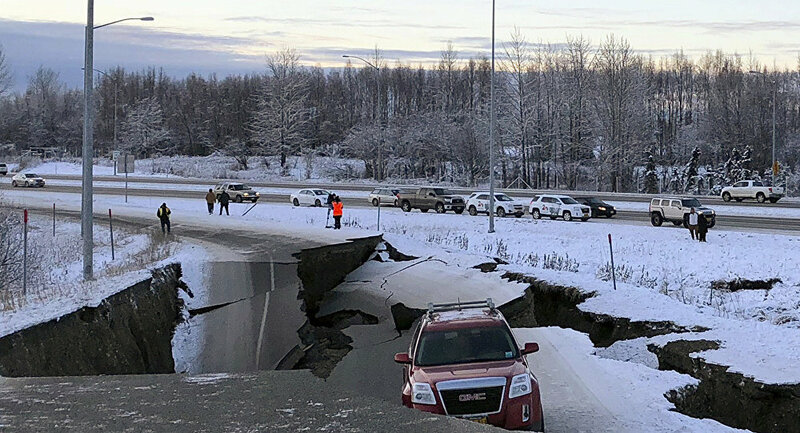 ​A National Weather Service employee who was the lead on shift in Anchorage took to Twitter, calling the experience "the scariest earthquake I have ever been in." ​Sitting on the Pacific-North American tectonic plates, Alaska averages about 40,000 earthquakes per year, according to the AP. The US Geological Survey reported that the Friday earthquake was the "result of normal faulting at a depth of about 40 [kilometers]." ​"Focal mechanism solutions for the event indicate slip occurred on a moderately dipping fault striking north-south (dipping either to the east at about 30 degrees, or the west at about 60 degrees)," the agency explained. "At the location of this earthquake, the Pacific plate is moving towards the northwest with respect to the North America plate at about 57 [millimeters per year], subducting beneath Alaska at the Alaska-Aleutians Trench, approximately 150 [kilometers] south-southeast of this event." "The location and mechanism of this earthquake indicate rupture occurred on an intraslab fault within the subducting Pacific slab, rather than on the shallower thrust-faulting interface between these two plates," the statement concluded. ​On March 27, 1964, Alaska was struck by a 9.2 magnitude earthquake, 75 miles east of Anchorage. The quake, which lasted roughly four minutes, claimed roughly 130 lives. According to AP, it is the strongest recorded earthquake in US history.